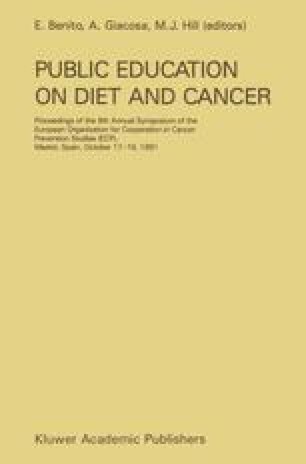 In 1985 the European Organization for Cooperation in Cancer Prevention (ECP) and the International Union of Nutritional Sciences (IUNS) held a workshop on diet and human carcinogenesis in Aarhus, Denmark. They issued recommendations to the public, to the food industry, to governments and other organizations and to the scientific community (Consensus statement on provisional dietary guidelines). Meanwhile, further data have become available on different aspects of the prevention of cancer by dietary advice. For this reason, the recommendations of 1985 will be reviewed in the 1991 ECP Symposium.